Compared with an armed struggle, the party chief favored political means to achieve revolutionary change.”It will be what we call a democratic path. One that utilizes the electoral arena but also other democratic venues where we’re constantly trying to expand our rights,” he said. Founded in 1919, the CPUSA has some 5,000 members spread across the country. The party has been active in a range of political and social movements workers’ rights to environmental protection and peace issues, according to Bachtell. We hope to “help spur discussions about the need for socialism in the United States and how capitalism is ultimately the root of a lot of our problems,” he added. “It both takes the form of protests in the streets and organizing lobbying and demonstrations. But it also takes cooperation in the electoral arena where we have an alliance of organizations” so as to avoid being “extremely isolated,” he said. The leader further explained that the U.S. Communist movement had a really difficult time amid McCarthyism in the 1950s and the anti-Communism narratives ever since, as the CPUSA was once declared illegal. It has taken a long-term struggle to restore legality and present a true image of itself. “They’re doing everything in the interests of the richest people, and in the end the biggest corporations,” he said. “The tariff issue… is a damaging move” that gives false hope to a tiny section of the working class, pitting them against the U.S. farmers as well as workers from other countries. Speaking of China, Bachtell said the CPUSA and the Communist Party of China (CPC) have forged “fraternal” ties. “And we try to find time to get together and to have bilateral meetings. We also have cooperated on the academic level. But it’s not enough,” Bachtell said, adding that his party would like to see “a higher and closer relationship” with the CPC, including mutual visits. “I think China is going forward to influence more and more every aspect of life, not just because of its sheer size and influence in the global economic system, but also because of its focus on uplifting working people and eliminating poverty and providing a basic material standard of living to every person,” he said. Bachtell further noted that the CPC’s performance in governance and leadership will continue to be an important example of what can be done.”We may not have the same concept about our models of socialism (with) a different reality, different material circumstances and different history, but China’s developing. Certainly it’s an important example and we can draw upon the experiences that you have,” said Bachtell. “I’m sure that there will be plenty of opportunities in the future for us to work together, absolutely,” he said. 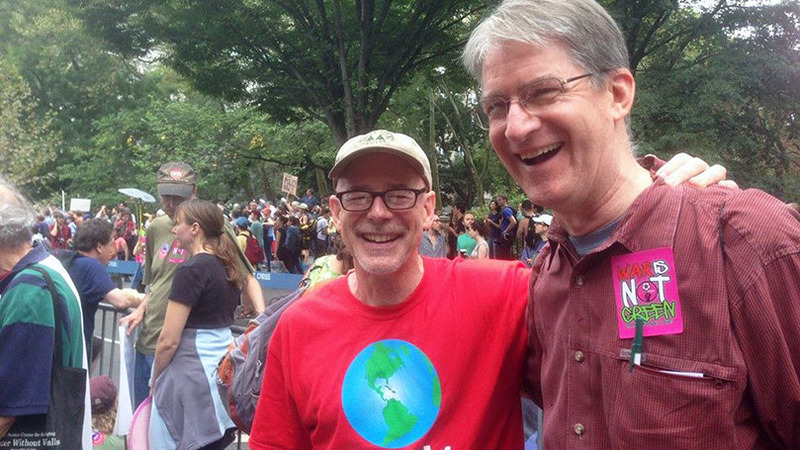 Image: John Bachtell, center at Peoples Climate March.